With a population of 8.4 million people, the Jewish state has outperformed its European counterparts. Israel’s GDP growth of 69 percent, since being upgraded to developed-market status in 2009, is more than 17 times what Austria accomplished and almost three times what Switzerland achieved, according to data compiled by Bloomberg and highlighted in an op-ed entitled 'Israel’s Economy Is Too Strong to Argue About' on January 24, 2019. The country's startups raised nearly $300 million in August and an estimated $650 million in July, according to IVC-ZAG. This sum can be added to the more than $3.1 billion that Israeli startups raised in the first half of 2018, on track to beat last year's record, as reported by Globes. Israel officially surpassed Japan in gross domestic product (GDP) per capita, Prime Minister Benjamin Netanyahu reported in June 2018. Israel’s economy marked another unusually strong quarter of growth in the first three months of 2018 as consumer spending, imports and investment soared, according to the Israeli paper Haaretz. Intel submitted detailed plan for $5 billion plant expansion in Israel. A report from the International Monetary Fund (May 2018) confirms strong economic growth for Israel. The Israel Export Institute and the Economy and Industry Ministry announced in May that the rapid growth that characterized Israeli exports in 2017 is continuing in 2018. In a statement issued April 17, 2018, credit rating agency Fitch Ratings has affirmed Israel’s grade of ‘A+' with a stable outlook. A $15 billion deal in 2018 to export Israeli gas to Egypt brings the formerly resource-poor Jewish state a step closer to becoming an energy exporter to the most populous Arab country. Intel to invest $4.5 billion in Israel in 2018. 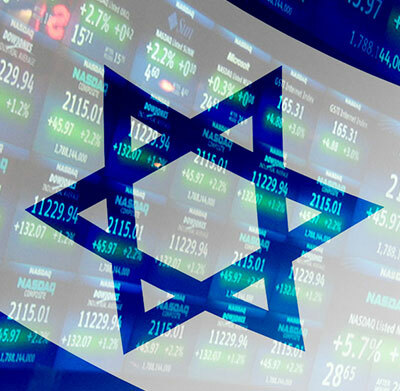 Standard & Poor’s (S&P) holds Israel’s rating at investment grade, with a positive outlook. S&P, the provider of independent credit ratings, issued a report in February 2018 reaffirming Israel’s credit rating at third-highest investment grade with a positive outlook, stating it expects Israel’s economy to remain strong. “The ratings are supported by Israel’s prosperous and diverse economy, strong external balance sheet, and flexible monetary framework,” S&P highlighted in the report. (Israel bonds are not rated). Israeli exports for 2017 expected to pass $100 billion for the first time. Israel signs first-of-its-kind agreement with Japan to facilitate Japanese investments in Israeli companies. In December 2017, a delegation headed by Israel’s Minister of Economy Eli Cohen and eleven Israeli cyber firms reached a deal which aims at increasing bilateral trade between the two countries, allowing Israeli advanced manufacturing companies to work with companies from Japan, a nation home to the world’s third largest economy. DowDuPont, conglomerate of two major U.S. corporations formed in 2017, expanded operations in Israel in the same year. Intel has completed the first stage of the $15.3 billion purchase of Mobileye, an Israeli technology company that specializes in producing sensors and cameras for autonomous cars, as of August 2017. BlackRock, Inc., an American global investment management corporation based in New York City which oversees $5.4 trillion in assets, opened its first office in Israel in 2017, tapping into the country’s engineers and programmers to help improve the firm’s global platform in a changing asset-management indus­try. Israeli high-tech companies closed 104 deals in 2016 worth $10 billion, up 12% from 2015, according to the IVC - Meitar High-Tech Exits Report. The figure includes 93 mergers and acquisitions worth nearly $8.8 billion, including the $4.4 billion Playtika acquisition, eight buyouts that generated $1.22 billion and three small IPOs totaling $15.1 million. View the most recent Government of Israel Ministry of Finance Office of the Accountant General Investor Newsletter here.